Crochet clothing requires more of an investment than many other projects – more yarn, more time and often more skill. But you also get more of a reward when you finish a terrific crochet item that you can wear or gift to someone else. 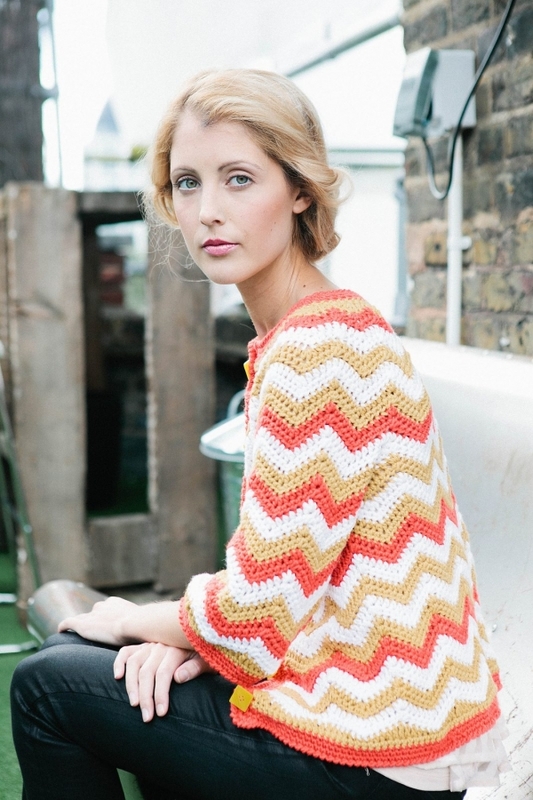 Here are fifteen 2015 crochet clothing patterns for you to try! Pop Goes Crochet! A book of celebrity-inspired crochet patterns. Rainbow crochet tunic free pattern @crochet_stuff. This is a simple striped crochet tunic pattern that’s worked with rainbow colored inspiration. It’s openwork, so it works as a crochet coverup like you see in the photo, but it also works as a t-shirt with a tank underneath or if you made it longer it could be a dress worn with a slip underneath. You could also opt to line it if you have more advanced sewing skills. If the bright colors don’t work for you, try making it in an ombre or even a solid color instead of using the color changes in the instructions. 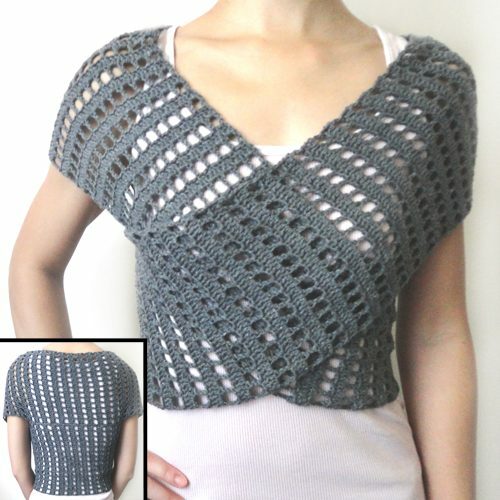 This is a fabulous free crochet clothing pattern. Crochet jacket pattern by Doris Chan for sale at WEBS. This is a sophisticated pattern that’s perfect for layering and can add a great sense of style to even the simplest of outfits. You could add buttons to give it a slightly different style. Another way you could change this up would be to work the front flaps and sleeve ends in a second color. Have fun with your crochet clothing patterns! Cherry blossom crochet halter corset pattern for sale from @crochetkitten who provides a related tutorial for working with boning. This is one of my personal favorite ideas for crochet clothing. It shows a stunning sense of style and gives you some advanced clothing constructions skills at the asme time. Plus isn’t that stitch pattern terrific?! Wear it over a dress for a formal event! Purple crochet dress free pattern by Beautiful Crochet Stuff. 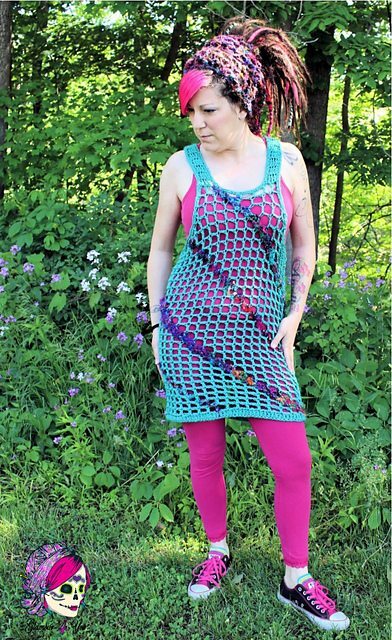 The vertical lines on this crochet dress pattern give you length and since the dress is short it makes your legs look like they go on for miles. Of course, if it’s too short for you, you could make it longer or wear it as a long top instead of wearing it as a dress. Either way it’s a great piece to add to your collection of handmade crochet clothing. Crochet summer dress free pattern from Annoo’s Crochet World. This openwork waist gives the illusion of a two-piece outfit here with a high-waisted skirt that’s perfectly in style. Worked in white as shown here it’s great for everything from beachwear to summer weddings. You could work the top and bottom in different colors, work all three parts (when you include the middle) in an ombre, or work the middle in a different color while keeping the top and bottom the same. Each of these would change the effect of the piece entirely. Fringed crochet boho vest pattern for sale from Outstanding Crochet. This crochet pattern is a great variation on a lacy floral square that’s been combined together with fabulous autumn colors into a long vest. This is great for music festivals and other boho events but also contemporary enough to fit into various fashion styles. Filet crochet flower vest pattern for sale from Alessandra of Just Be Happy Crochet. It’s always fun to work in filet crochet, where you can create stunning graphics using just simple crochet stitches. This floral vest is a stunning example. 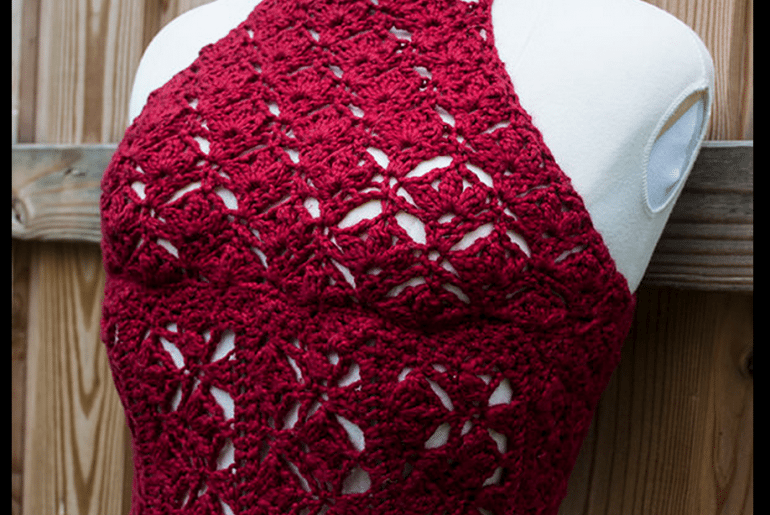 Crochet crop top free pattern from @crochet_stuff. This site really offers so many great modern styles of crochet clothing. This top is closed-stitch pattern so it could work for many people without another shirt underneath. However, it would also look wonderful layered over a tank or even a long-sleeved colored blouse. It would also look great peeking out from underneath a button down shirt. Wear it over a dress for a completely different style. Twisted tank silk sari yarn crochet pattern for sale from Glamour4You. 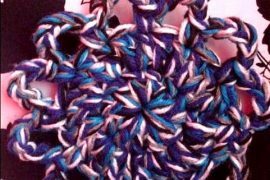 I love this fun use of sari silk yarn, which could be an inspiration for using various bulky and novelty yarns. The tank itself is a great basis for weaving, cross stitch and just generally playing with ideas. Consider it your canvas. That said, you can use the pattern exactly as is, to make a tank or tank dress worn layered over other clothing. 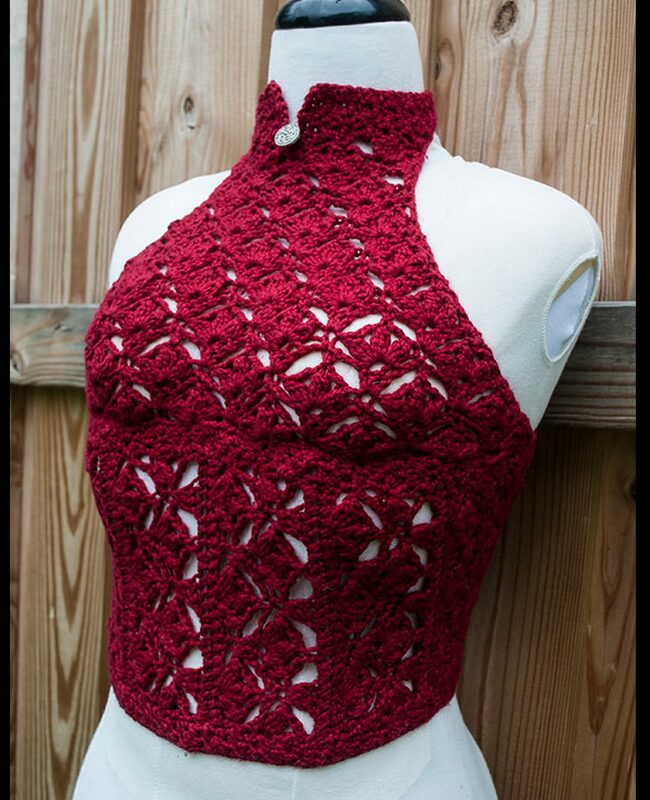 Crop top halter free crochet pattern @crochet_stuff. 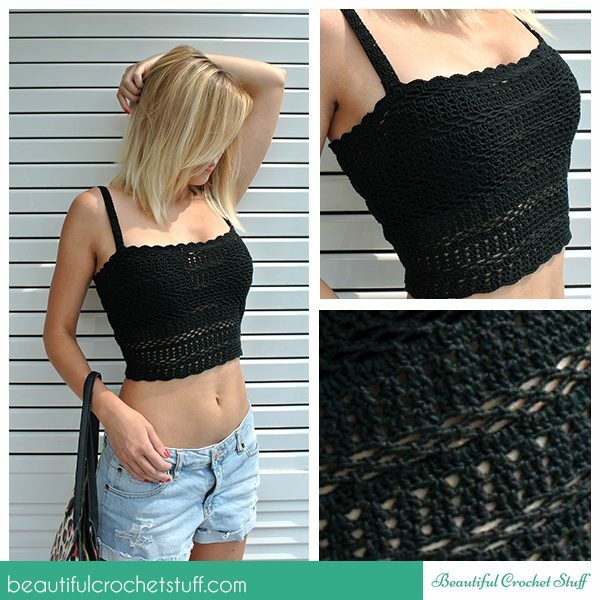 This crochet top could be implemented with versatility just like the above bikini top was described. You could also keep it the way it is but add additional rows for length if you like the style but not the cropped version. Striped eyelet wrap sweater crochet pattern for sale @crochetspot. This is a simple style for a uniquely shaped shirt that is so much fun to make and wear. Play around with it! Pair it with a slim crochet skirt for a great handmade outfit. Crochet skirt free pattern @UCrafter. The design, length and color of this crochet skirt would work for a wide variety of body types and ages. It’s a great staple piece to incorporate into your wardrobe. Line it or wear it over a slip. Madrona chevron crochet cardigan pattern for sale from Rohn Strong – a wonderful, retro-inspired unique design that pops with color and makes a huge statement. Monokini swimsuit free crochet pattern @crochet_stuff. Go bold with a crochet swimsuit pattern! I have been trying to find your pattern for your rainbow crochet sweater vest and had NO Luck. Please tell me how to find the pattern. Thanks so much!